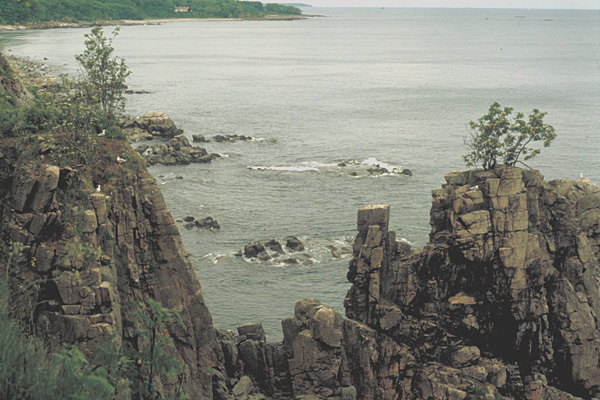 The only place in Denmark where the bedrock can be seen is at the island Bornholm especially in the north. Driving along the coast one can see coastal cliffs of varying hights up to around 40 m as around The Holy Cliffs - in danish Helligdomsklipperne - in the picture. Where the cliffs lie near the sea level, waterfilled rockpools with a very interesting fauna is created. In other places the lower coasal cliffs arre covered with a thin layer of soil and one can experience a very diverse vegetation and interesting flora too. The Holy Cliffs - Helligdomsklipperne (Foto : Jørgen Terp Laursen).